Mother's Day is coming up on May 10th. I will actually be in Geneva with my mom from May 9th-16th, so posting on my end may be light, and, as we've already covered, I highly doubt there will be cupcakes involved, unless I bring them over from New York. Teacake Bakeshop, based in Emeryville, California, does Next Day Air cupcake delivery (I just placed my first order - for non-Mother's Day cupcakes - so will report probably tomorrow on their shipping). These costs $45 (plus $26.95 shipping, for a $71.95 total). Each cupcake is frosted by hand and decorated with our hand-crafted fondant pink and ivory blossom decorations and MOM fondant circles. Each cupcake is nestled in our pink signature gift box held snugly in place with our custom pink cupcake insert. (3) Madagascar Bourbon Vanilla Cupcakes with Vanilla Buttercream, (3) Chocolate Sour Cream Cupcakes with Chocolate Buttercream, and (3) Pink Velvet Cupcakes with Cream Cheese Frosting. Want to send Mom something really special this Mother’s Day? Send her a box of Mrs. Beasley’s famous Gourmet Cupcakes! Each cupcake is hand made and hand-decorated using all natural ingredients like fresh fruits and premium extracts. 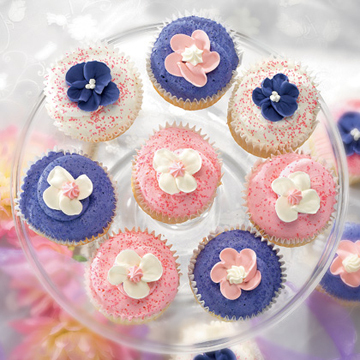 Our Mother’s Day collection contains two each of our Grape, Strawberry and Vanilla cupcakes. Shipped in special packaging with dry ice, so they arrive in perfect condition for Mom to enjoy. Please note: Our cupcakes require special shipping and handling. 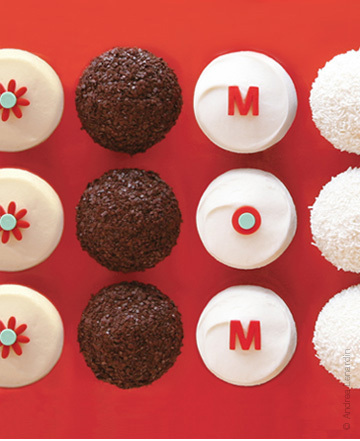 Sprinkles Mother's Day MOM box of cupcakes - price not listed. This includes lemon, dark chocolate, vanilla and red velvet, and is available May 8-10. They also sell MOM loves Sprinkles t-shirts. WOW! These look so yummy and so beautiful! They almost seem not to be cupcakes but pure pieces of art! I'm not sure I could eat one of those -- I'd feel bad about eating such beauty! I say WOW! to that as well. They look delicious. They are really talented to make these cupcakes with such details. Nice post! Oh, these are all SO PRETTY!!! 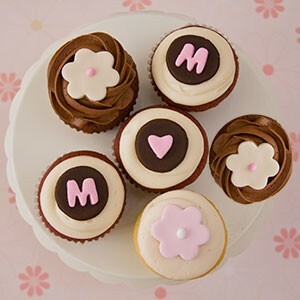 I am getting tea for my mom for mother's day, and hmm..... now you've put the idea of cupcakes into my head! I can't wait to see how they come out once shipped to you! Please, please take massive photos and let us know! I know Carrie over at Fields of Cake has been testing it, too, so she would love to see! Thanks!